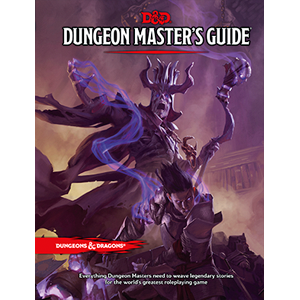 Whether you’re a complete novice to the Dungeons & Dragons world, an experienced player who is finally looking to take over the Dungeon Master reigns, or an experienced Dungeon Master who wants to stay up to date on the latest innovations, a Dungeon Master’s Guide can be an invaluable tool for keeping your game running smoothly. Including tons of information on everything D&D, it’s a how-to guide that answers every question. After a short introduction that briefly covers the duties of a Dungeon Master and how to use the book, The Dungeon Master’s Guide splits into three parts: Part 1 is entitled Master of Worlds, Part 2 is Master of Adventures, and Part 3 is called Master of Rules. Master of Worlds is intended to help you figure out your campaign, and creating a world around it. This can be entirely of your own making, or you can pull as much from the existing D&D world as you like. The aptly named Master of Adventures section is a guide to creating the adventures your party will enjoy, from creating NPC’s and dungeons, to the types of treasures your party might encounter. Master of Rules is a guide to mediating the game, with information on everything from handling mobs to basic combat. The end of the book contains appendices on Random Dungeons, Monster Lists, Maps, and Dungeon Master Inspiration. Between the three parts and the appendices, it covers all the essentials for coming up with a campaign, running your adventures, and applying and modifying rules to suit your group – and all of that organized in a way that makes it a simple task to quickly find the information you need. Each section features colorful Dungeon & Dragons inspired artwork, illustrations of useful items like armor and weapons, and loads of tables that are filled with all of the information you’ll need to run a successful campaign. The book itself is a sturdy hardcover volume, printed on quality paper that should stand the test of time nicely. A compact volume it is not, measuring roughly 9 X 12, and 320 pages. While it may be a bit of a brick to lug around, the reams of useful information it contains make it well worth the added effort. The Dungeon Master’s Guide is a solid investment in making your D&D game the very best it can be.